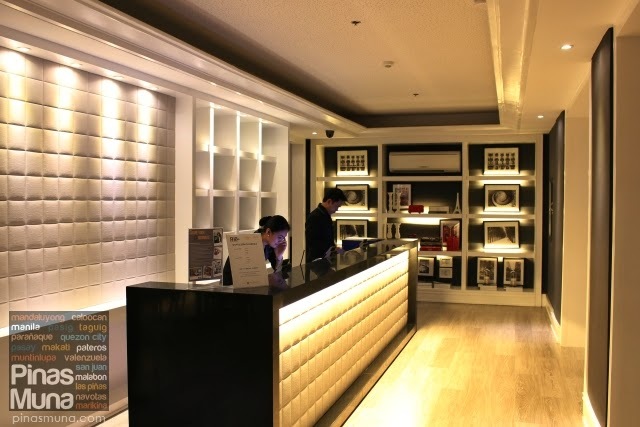 Azumi Boutique Hotel is a 187-room hotel located in Madrigal Business Park in Alabang, Muntinlupa City. The hotel opened in January 2014 making it the newest hotel in the area. 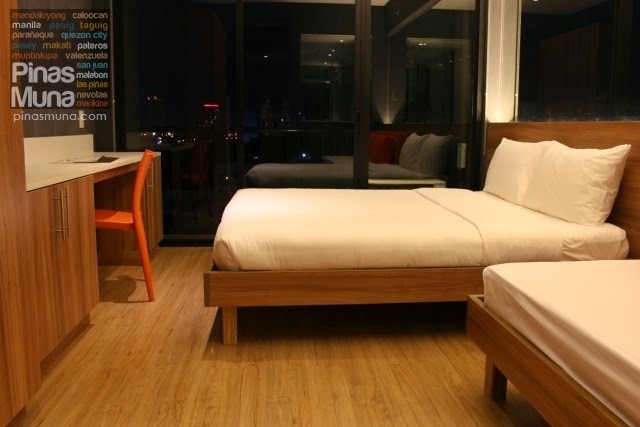 Managed by Hospitality Innovators Inc (HII), Azumi Boutique Hotel caters to both business and leisure travelers in search of a hotel centrally located in Alabang with easy access to business, leisure and dining destinations. HII is the same property management company behind Picasso Serviced Boutique Residences in Makati, Joya in Rockwell and The Henry in Cebu. 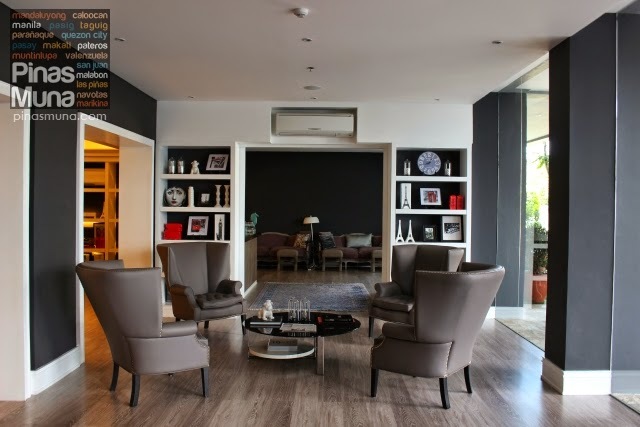 This July, we were invited by Azumi Boutique Hotel to experience a relaxing weekend staycation in Alabang. We always wanted to explore this southern part of Metro Manila and this is the perfect opportunity for us, so we said yes to their invitation. Coming from C5, it only took us a 20-minute drive along SLEX to reach Alabang via the Filinvest Exit (toll fee: P122.00). We arrived at 11:00am, right on time for lunch at P.F. Chang's in Alabang Town Center. After lunch, we drove to Madrigal Business Park located few blocks away from Alabang Town Center. Upon entering the business complex, Azumi Boutique Hotel will be the first building you will see. You won't miss its distinctive grey building with orange accents. Parking isn't a problem because every hotel room has a corresponding parking space inside the building. 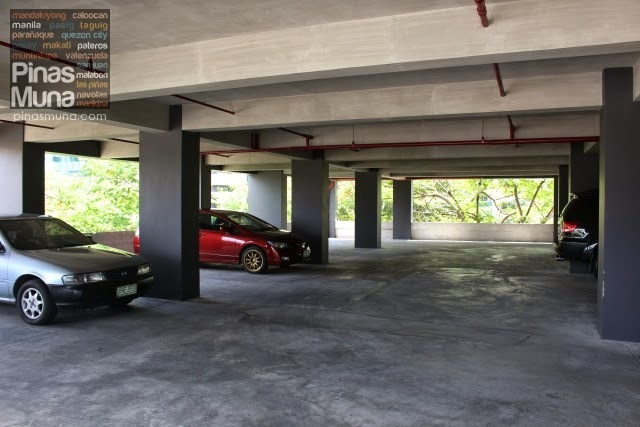 The multi-level parking has 24-hour security and has CCTVs on every floor so your car is very safe here. Parking is free for checked-in guests. Just have your parking ticket verified by the hotel's receptionist. After parking our car, we took the elevator to the ground floor where the hotel's reception is located. The hotel's lobby has a stylish retro-chic design accentuated by books, photographs and travel souvenirs that are matched with cozy and classy furnishings and centerpieces. The floor-to-ceiling glass doors and walls allow natural light in and illuminates the interior of the lobby creating a feeling of warm open space. The lobby is well air-conditioned while the chairs provide a comfortable and relaxing space for reading a book or the newspaper. It was truly a welcoming sight to arriving guests or business travelers retiring from a busy day. Checking-in was quick and efficient. After filling-out the necessary registration forms and presenting a valid identification card, we were asked to sit at the lobby while our check-in was being processed. In a few minutes, our key cards were ready and we were assisted to our room. These key cards are recently becoming a standard in many high-end hotels in Metro Manila. 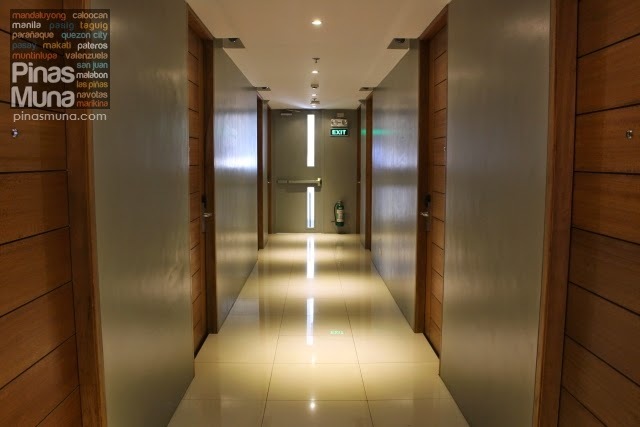 It is a great security measure because the elevator automatically limits the access of the guests to the floor where their assigned room is located. The same key card is also used as an electronic key to open the door to the guest's designated room. Lastly, the key cards also has power-saving features as it acts as a power-switch to the room, activating power when the card is placed inside the wall slot, and cutting off power when removed. Note that up to two key cards may be issued per room. During our stay, we were assigned to a Corner Queen Room located on the 6th floor of the building. Our room measures 25 sqm with a queen size bed and a day bed that is convertible to a single bed. The room has an individually controlled air-conditioning unit, a cable-ready LED TV, a spacious working desk. Highspeed WiFi Internet connection is also provided per room. 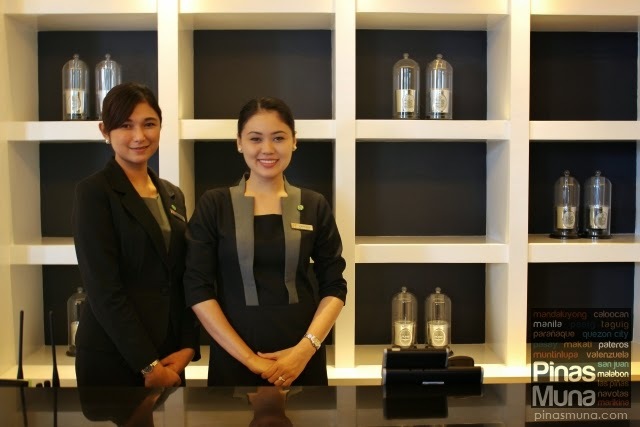 The hotel receptionist will provide you with the user name and password upon check-in. The bed is very comfortable, it has just the right firmness we wanted. And so are the pillows. The linens smelled clean and fresh. The room's interior follows the same color theme as the building's exterior. The walls are colored grey while accents of orange pillows and chair are incorporated into the design. 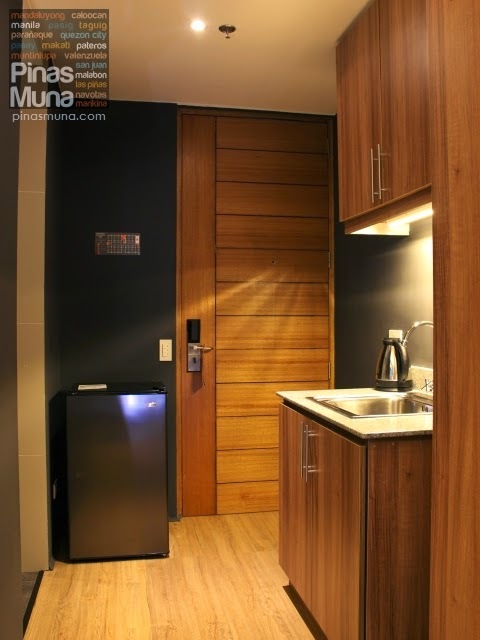 The wooden panels on the floor and cabinets give a rather warm and cozy feel inside the room. The use of mirrors and floor-to-ceiling glass door makes the room look more spacious. The room also has a small pantry equipped with a mini-refrigerator, a coffee/tea-making facility, a microwave oven and a sink. Iron and ironing board as well as hairdryer are available upon request. The bathroom has a walk-in shower with hot and cold water. Soap, shampoo and body wash are provided, as well as towels and a roll of tissue paper. 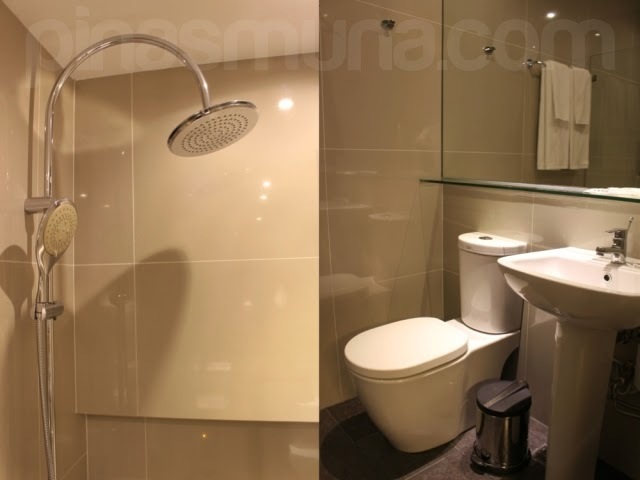 The water pressure is generally strong but there are times of the day when the water pressure isn't that strong which makes it difficult to control the temperature of the heated shower. The towels, on the other hand, smelled clean and fresh. The bathroom looks well maintained. We were a bit disappointed that the toilet is not equipped with a bidet. The good news though is that toilets are now being retrofitted with bidet, one floor at a time. The Queen Room, Corner Queen Room, Garden Room and Corner Garden Room almost have the same room features and facilities, the difference lies on the attached balcony. 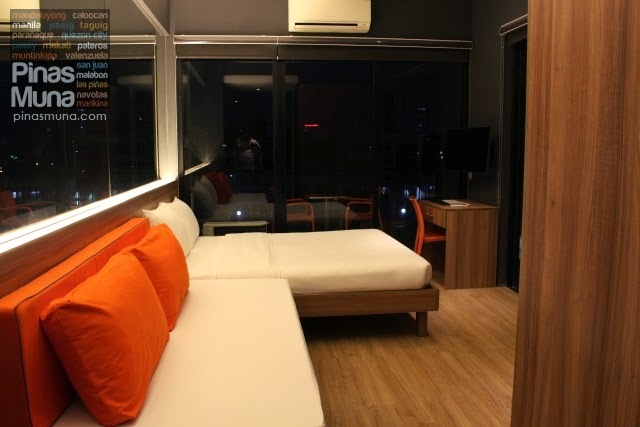 The Queen Room has one balcony while the Corner Queen Room has a two-sided balcony, but both measures 25 sqm. The Garden Room has a garden balcony while the Corner Garden Room has a two-sided garden balcony. They have a total area of 47 sqm. Tip: Garden Rooms and Corner Garden Rooms are located on the 5th floor of the building. Garden balconies have a set of table and two chairs ideal for al fresco dining. Note that most en suite bathrooms are glass-walled. While some have privacy blinds others don't. A few rooms are not glass-walled so when making your reservation, make sure you specify your preference. When staying alone or with your spouse, a glass-walled bathroom may be okay, but for a group of friends, a non-glass-walled bathroom may be more appropriate. We were told that privacy blinds are now being installed in all glass-walled bathrooms. Another room type is the King Room. 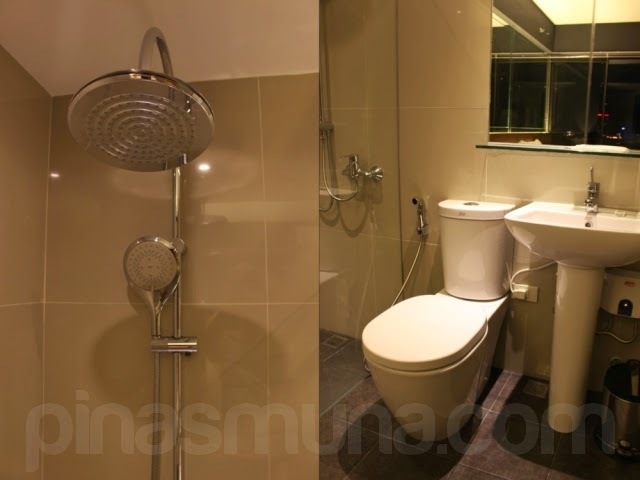 It has a floor area of 30 sqm, slightly bigger than the Queen Room. 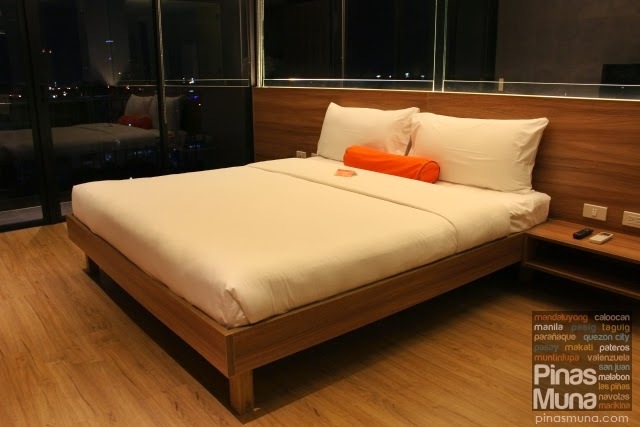 It has a king size bed and the absence of a day bed frees up more space inside the room. It is equipped with the same facilities as the other rooms. All King Rooms have glass-walled bathrooms so it is suitable for solo guests or couples. Since a King Room only has a glass door separating it from the balcony, guests can use the blinds to have more privacy. There's only one King Room per floor and are said to be very much in demand for honeymooners. There is another room type called A-Villa. Unfortunately, there's only one unit of A-Villa located on the penthouse and it was occupied during our stay. After our tour around the hotel, it was time to try out another restaurant in the area. We drove back to Alabang Town Center and had Dinner at California Pizza Kitchen. If you don't have a car with you, Azumi Boutique Hotel offers a scheduled free shuttle service to nearby malls. Just check the schedule at the front desk. 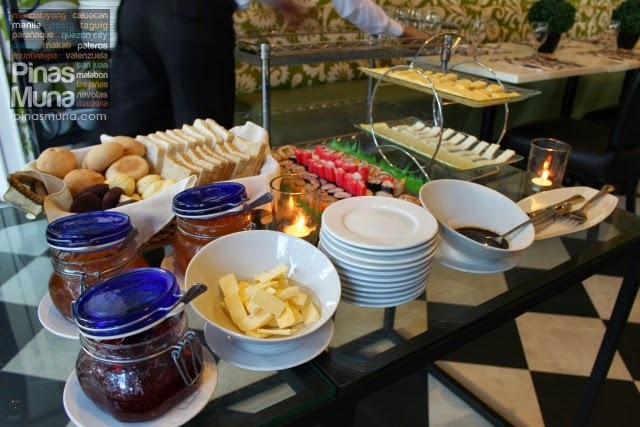 The following morning, we woke up early for breakfast at the hotel's in-house restaurant. 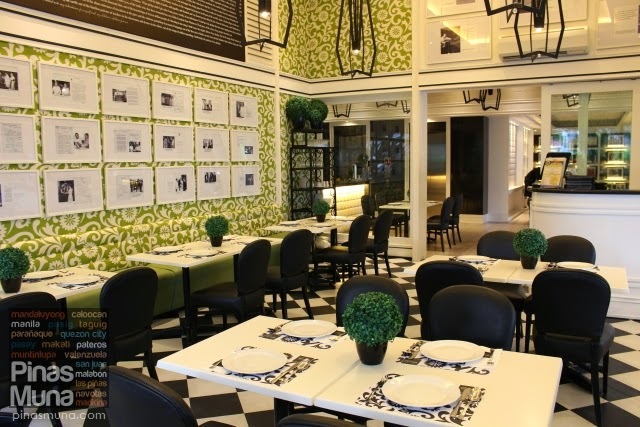 Romulo Cafe offers gourmet-style Filipino dishes in stylish, high-society setting with a touch of history. 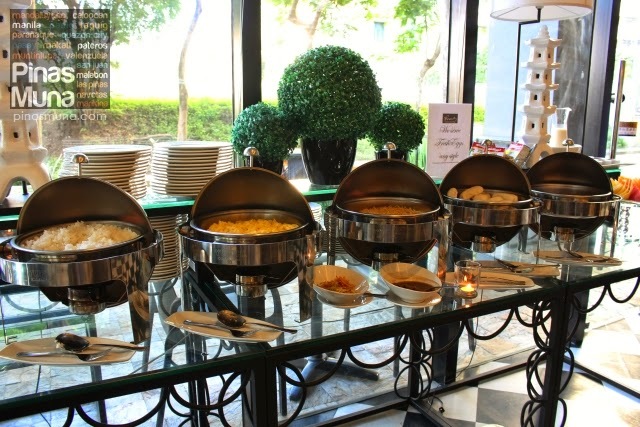 Our room accommodation includes buffet breakfast for two and is available from 6:00am to 9:00am. We had light breakfast that morning as we were still very full from last night's dinner. We really wanted to try their Filipino breakfast but during our visit, the restaurant served oriental-themed breakfast. 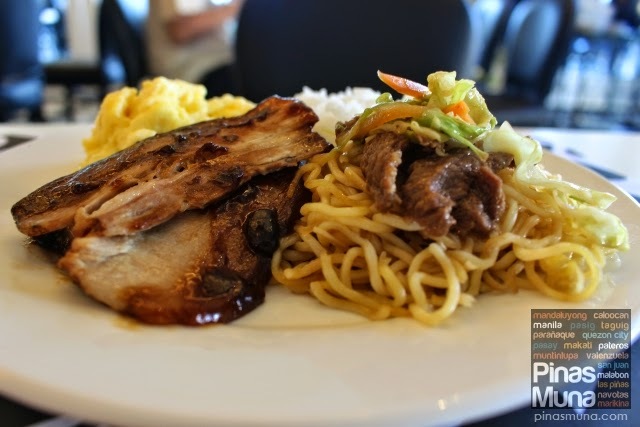 The food was okay, but we think oriental food does not fit the image of Romulo Cafe. 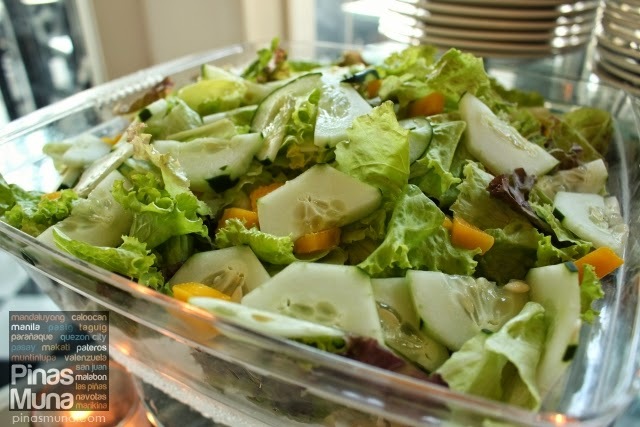 We suggest that they should stick with Filipino dishes. 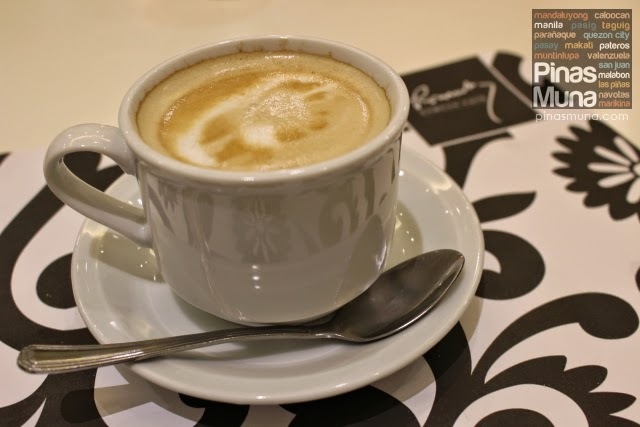 By the way, they serve very good coffee here at Romulo Cafe. 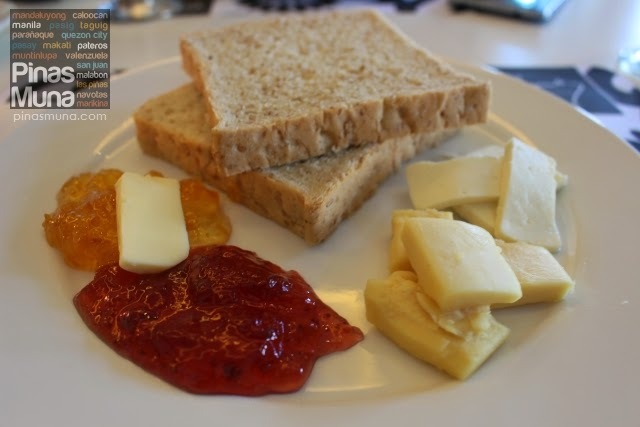 The buffet breakfast comes with unlimited brewed coffee, but I suggest that you also try their caffe latte (additional charges apply). After breakfast, we spent the rest of the morning swimming at the hotel's infinity lap pool. 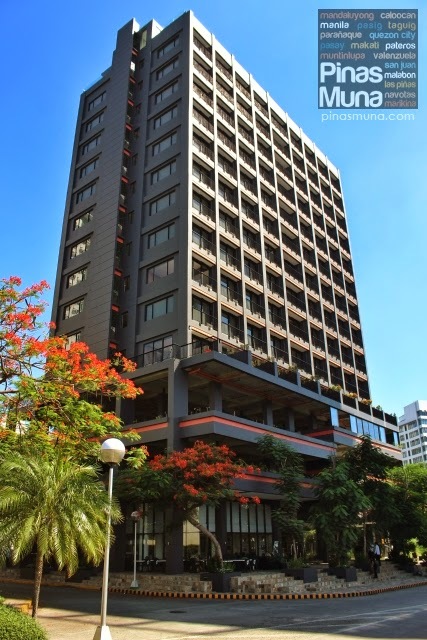 Because it is located on the top most floor, it offers a 360 degree view of Alabang and nearby cities. Laguna de Bay, Mt. Makiling, the Makati skyscrapers and the airport are all visible from here. Standard check-out time is at 12:00 noon. Checking-out was also fast and efficient. After payment of our a la carte orders from Romulo Cafe and a quick check of our room by the hotel's housekeeping, we were cleared for check-out. The hotel receptionist verified our parking ticket and off we went to the floor where we parked our car. 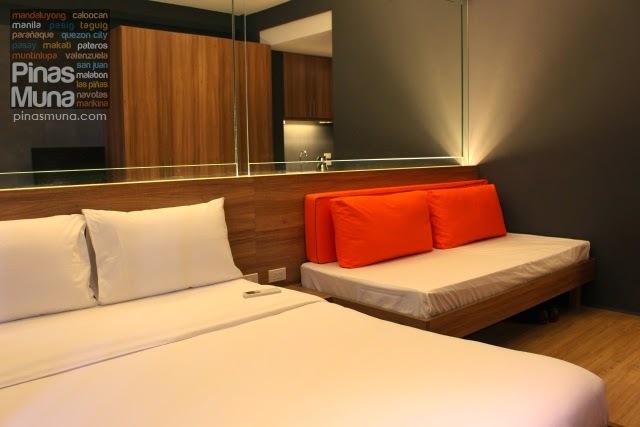 Overall, we enjoyed our stay in Azumi Boutique Hotel. The staff is very professional, customer service is excellent! 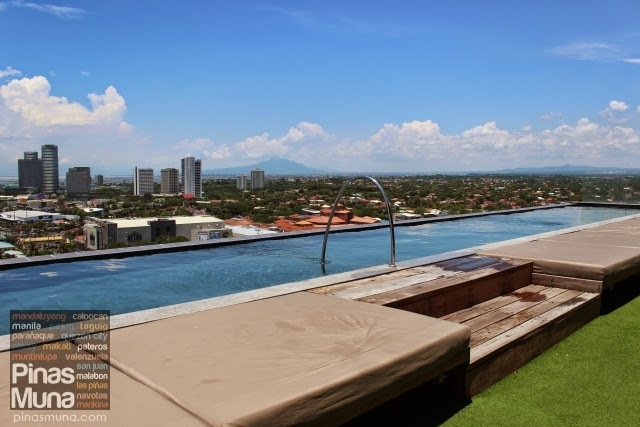 We had a relaxing sleep, we enjoyed the swimming pool, and dining destinations in Alabang Town Center and Filinvest are very accessible from the hotel. 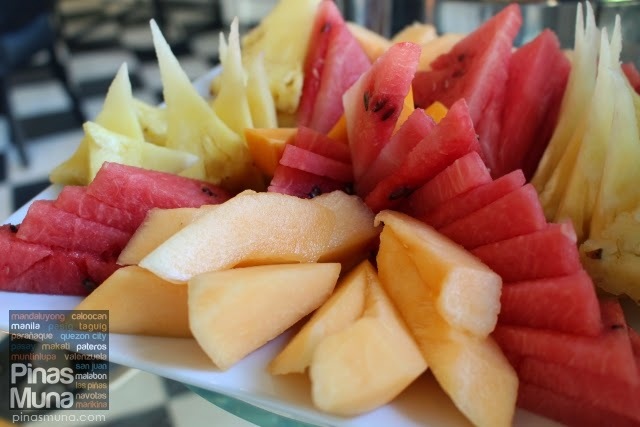 We find the hotel ideal for leisure travelers who wish to unwind from the daily grind in the city or explore the gustatory offerings of southern Metro Manila.